FIX Trading Community™ is a brand of FIX Protocol Ltd, a non-profit UK registered entity, originally created to own, maintain and develop the FIX Protocol messaging language. FIX® is embedded into the fabric of the financial trading community, used by thousands of firms every day to complete millions of transactions in a cost-efficient and effective manner. FIX has been created and continues to be developed through collaborative industry efforts with the intention that it remains as a non-proprietary, free and open protocol. Maintaining this position is of utmost importance, as the cost to the industry of a fee based alternative would prove incredibly expensive. 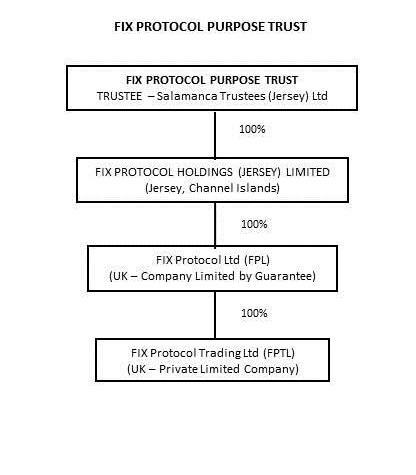 To ensure this status is protected, FIX Protocol Ltd is managed under a special “Purpose Trust” which owns the assets and enables the organisation to concentrate on promoting protocol adoption without undue risk or exposure. An effort that is further supported by legal protection afforded through the fees paid by member firms. The Trust deed defines the “purpose” and states that the protocol will remain “open” and available royalty free in perpetuity. It also seeks to establish the neutrality of the protocol and effectively formalises the principles on which FIX Protocol Ltd has been based. It does all this, and at the same time gives new powers to the organisation’s members to set the direction that the company and its officers shall follow. Please see a list of frequently asked questions related to FPL's corporate structure via the above link.